This issue’s article is by Robin Jackson who has recently started a Vedic Math Blog. The following notes are a personal record of my discovery of Vedic math. 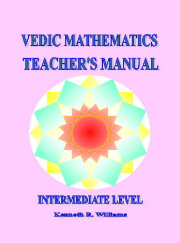 I am a language teacher with an ordinary school math background, and I first encountered Vedic math on the Internet in the process of looking for an appealing approach to use in teaching math to my own children. This discovery has been one of the great surprises of my life, and I hope to briefly be able to explain why I think this was the case. Prior to my encounter with Vedic math, I had become discouraged with conventional math instruction, due in part to the seemingly random aspects of the learning process. The problems seemed randomly chosen and arranged, and the emphasis was more on accurate arithmetic than on interesting concepts, so typical worksheets seemed laborious. I had a vague idea that mathematical patterns appear in nature, but nothing I had done in my schooling pointed to anything striking here. Discovering Vedic math was a lot like wandering in an arid valley and coming across potshards from a long- lost civilization. Whether or not people believe that the mathematical understanding of this long-lost civilization could have been meditated through contact with a piece of text, Vedic math discloses a world of complex and beautiful patterns in nature reflecting themselves in the number world, and vice versa. There were several surprises here. The first surprise was that the Vedic math tools were empowering. The method of transportation, so to speak, made me feel like I was wearing seven-league boots or stilts, or that I had grown wings. It was fun because I was making a great leap each time I calculated. I didn’t always understand what was powering my vehicle, not having a full understanding of the underlying patterns, but it was a pleasure to apply the simple method of squaring two-digit numbers ending in 5 and the rapid way to multiply two numbers close to a base, as well as seeing the magic squares uncovered by multiplication. The one-line method itself, even if one makes mistakes in arithmetic, is very appealing because each result is a satisfying step forward. It was also empowering to realize that there is more than one way to solve a problem. I found that there were four different ways of squaring two-digit numbers ending in five, for example, and each one is easier than the last. The doubling and halving exercise also shows that there is more than one way to multiply two numbers. I had always calculated with a pencil in hand, and it had never occurred to me to turn 14 X 3 into 2 X 21, and this technique opens up quite a few vistas. I was so thrilled with these methods that I feared there were only a few of them. When I showed my friends the patterns of nine in digit sums, they also asked “if there were more like that.” I was having so much fun that I was afraid the amazing patterns would be exhausted with the amazing digit sums of nine and its multiples. My fear turned out to be quite groundless. Recently I watched a video that showed that water that had been subject to certain positive conditions – analogous to the positive environment of a child who is loved -- fell into amazingly beautiful patterns, while under other distressed conditions, this was not the case. It appears that patterns underlie everything in the universe, and Vedic math commands an understanding of this. The third surprise was the fact that so few people had any familiarity with these methods. When I showed the multiplication of two-digit numbers near a base and the squaring of two-digit numbers ending in five to a medical doctor friend and a businessman friend who calculates rapidly in his head, I found they were completely unfamiliar with this approach. Both could calculate mentally much more rapidly than I can with conventional methods, but even their rapid mental skills were no match for what I could do with the Vedic approach. I am interested in what accounts for this situation. I think of it a lot like a valley in which a people has been living for millennia. There are mountains on every side of the valley. One might suppose people could climb the mountains and see what is on the other side, but few people do so. The mountains are not especially forbidding, but the belief system of the people restricts their freedom of movement, so to speak. One of the assumptions or beliefs in their system is that there is simply nothing much to see on the other side of the mountain. What about paths crossing the mountains? They are overgrown. A recurrent memory helped me to understand my reasoning. I was about 8 years old and sitting at the top of the stairs in the old house we lived in, and the number 23 occurred to me. I was very fond of magic tricks at this time, and I was fond of creating number codes for time capsules which I would hide in places in the house that I thought no one would find until years later. Thinking about the number 23, it occurred to me to add the digits, as part of a code, though I suspected that if it were in any way valuable or meaningful to add digits, I would have been told about this already – presumably in school. The concept of irrational numbers also put me off. I was familiar with the term irrational mainly to refer to behavior that was considered stormy, unreasonable or inappropriate, so the idea that numbers were irrational resulted in a mild distaste for fractions that could only be turned into decimals that went on forever. What a surprise to learn that decimals translated from fractions such as 1/7 or 1/17 or 1/19 re-occur in sometimes amazing and even predictable patterns that can be worked out with simple methods. You need a pencil to do a math problem – you can do complex math in your head. The early steps of any learning project in math have to be repetitive and arduous – The early steps of learning math can be fun for children. A child cannot understand algebra. - Children reason naturally. Algebra and multiplication are separated by a wall. One must work extensively with arithmetic before venturing onto algebra, and the same applies to other aspects of math, that one must be “conquered” before the next concept is addressed. Math is about getting the right answer - Adding and subtracting/math is about understanding patterns. Complex math involves complex reasoning and laborious effort. - Recognizing underlying patterns can speed the process. Mathematics and images have nothing to do with each other - Mathematical images are beautiful and well-ordered. Creativity is appropriate in drawing or science, not in math - The Vedic approach enables people to experiment creatively with several approaches. In looking at the valley surrounded by mountains, I think it is best to view the valley as our own consciousness, the mountains as the immensity of different practical tasks in the world and the paths our intuitive reasoning. On the other side, unbeknownst to most of us still, is a boundless sea of understanding that can be skillfully navigated by Vedic wisdom. This new centre is called “ Vedic Method Education Centre Pte Ltd “ and is at 74 Thomson Road Singapore 307590. Face book account : VedicMethod Education Centre. The idea is simply that we all calculate from right to left as we were taught, but this is contrary to the natural flow as we read, write and pronounce numbers from left to right, not right to left. c) because all operations can be done left to right we can combine them. This leads to a very powerful technique which enables solutions to problems that would never normally be even attempted. Stewart Dickson has composed this message describing tactile Vedic maths, and an exhibition is being planned in Leicester, UK. “Alex's Adventures in Numberland” is the title of a new book by Alex Bellos, a UK journalist. ISBN: 9780747597162. The book is well-written and covers many interesting areas of maths in an entertaining style. There is a chapter on Vedic Mathematics. At the link below you can see an interesting article: “My Impressions of Math Education in the United States” by Rick Blum, Florida, USA, including how Vedic Math can help with the current math problems in teaching. Duplex, triplets numbers multiplied by duplex, triplets numbers. We know that 4 X 6 = 24. There are two 4’s and two 6’s. So start writing 24 till you get two times like this and then back to single 24 and finally add them. Ex ; 777 X 888 We know that 7 x 8 = 56 and there are three 7’s and three 8’s. So start writing 56 till you get three times and then back to single 56 and then add them. As a mathematics teacher I am encouraged at how vedic techniques can help kids improve their mental maths skills. My 10 yr old daughter surprised her grandad by mentally doing such questions as 35 x 35 etc. But apart from this , can you give me a detailed example of how vedic maths principles can be used to link topics together, particularly in the KS3 curriculum. I need convincing on this issue before I commit myself to your online programme. The system of Vedic Maths is based on a set of sutras/ formulas,(though these don’t need to be learnt). The Vertically and Crosswise formula is a good example: it enables one-line products of any numbers to be found from right to left or left to right. It uses a simple pattern and it is easy to understand why it works. This can be reversed to do one-line divisions, and exactly the same pattern can be used for algebraic products (which is also easily reversible for one-line algebraic divisions). Similarly the pattern simplifies for squaring numbers and this is reversible for square roots. The same vertical and crosswise pattern can be used for adding and subtracting fractions (a notoriously difficult subject for many children) – again in one line and easy to explain. The Vedic formula By One More than the One Before similarly has many uses: in converting fractions to decimals, squaring numbers ending in 5 which you referred to (and variations), rounding, divisibility testing, etc. The word ‘sutra’ means ‘thread’ and according to Bharati Krsna, who reconstructed the system, the sutras cover all areas of mathematics: they run like threads through the entire fabric of maths.